The long awaited Dark Knight Rises slot has been released by Microgaming and gives players the chance to win a staggering 1.5 million coins. 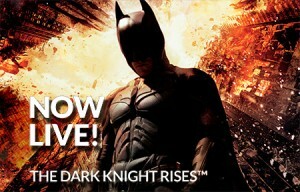 The much anticipated Dark Knight Rises slot has been released and it is packed with fantastic original bonus features. The slot is a 5 reel, 243 ways to win video slot which has a massive collection of new features such as “Split Wild” which forms a six of a kind winning arrangement and “symbol scramble” that rearranges symbols to create the best possible winning combination. Other great features include the Free Spins Accumulator which triggers at random and awards both Free Spins and multipliers. There are also scatters, multipliers, rolling reels, expanding wilds and much more. Check it out at your favourite Microgaming casino today.